^ Feulne r, Georg (2012). 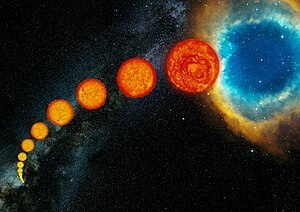 “The faint young Sun problem”. Reviews of Geophysics 50 (2). arXiv:1204.4449. Bibcode: 2012RvGeo..50.2006F. doi:10.1029/2011RG000375. ^ a b Sagan, C.; Mullen, G. (1972). “Earth and Mars: Evolution of Atmospheres and Surface Temperatures”. Science 177 (4043): 52–56. Bibcode: 1972Sci...177...52S. doi:10.1126/science.177.4043.52. PMID 17756316. http://www.sciencemag.org/cgi/content/abstract/177/4043/52?ck=nck. ^ Ribas, Ignasi (2010-02). “Proceedings of the IAU Symposium 264 'Solar and Stellar Variability – Impact on Earth and Planets': The Sun and stars as the primary energy input in planetary atmospheres”. Proceedings of the International Astronomical Union 264: 3–18. arXiv:0911.4872. Bibcode: 2010IAUS..264....3R. doi:10.1017/S1743921309992298. ^ Gough, D. O. (1981). “Solar Interior Structure and Luminosity Variations”. Solar Physics 74 (1): 21–34. Bibcode: 1981SoPh...74...21G. doi:10.1007/BF00151270. ^ Windley, B. (1984). The Evolving Continents. New York: Wiley Press. ISBN 0-471-90376-0. ^ Schopf, J. (1983). Earth’s Earliest Biosphere: Its Origin and Evolution. Princeton, N.J.: Princeton University Press. ISBN 0-691-08323-1. ^ Veizer, Jan (2005-03). “Celestial climate driver: a perspective from four billion years of the carbon cycle”. Geoscience Canada 32 (1). ^ Walker, James C. G. (1985-06). “Carbon dioxide on the early earth”. Origins of Life and Evolution of the Biosphere 16 (2): 117–127. Bibcode: 1985OrLi...16..117W. doi:10.1007/BF01809466. http://deepblue.lib.umich.edu/bitstream/2027.42/43349/1/11084_2005_Article_BF01809466.pdf 2010年1月30日閲覧。. ^ Pavlov, Alexander A.; Kasting, James F.; Brown, Lisa L.; Rages, Kathy A.; Freedman, Richard (2000-05). “Greenhouse warming by CH4 in the atmosphere of early Earth”. Journal of Geophysical Research 105 (E5): 11981–11990. Bibcode: 2000JGR...10511981P. doi:10.1029/1999JE001134. ^ Ueno, Y.; Johnson, M. S.; Danielache, S. O.; Eskebjerg, C.; Pandey, A.; Yoshida, N. (2009-08). “Geological sulfur isotopes indicate elevated OCS in the Archean atmosphere, solving faint young sun paradox Ueno, Y.; Johnson, M. S.; Danielache, S. O.; Eskebjerg, C.; Pandey, A.; Yoshida, N.”. Proceedings of the National Academy of Sciences 106 (35): 14784–14789. Bibcode: 2009PNAS..10614784U. doi:10.1073/pnas.0903518106. PMC: 2736450. https://www.ncbi.nlm.nih.gov/pmc/articles/PMC2736450/. ^ Marty, B.; Zimmermann, L.; Pujol, M.; Burgess, R.; Philippot, P. (2013). “Nitrogen Isotopic Composition and Density of the Archean Atmosphere”. Science 342 (6154): 101. arXiv:1405.6337. Bibcode: 2013Sci...342..101M. doi:10.1126/science.1240971. PMID 24051244. ^ Veizer, J. (1976). B. F. Windley. ed. The Early History of the Earth. London: John Wiley and Sons. p. 569. ISBN 0-471-01488-5. ^ Walker, J. C. G.; Hays, P. B.; Kasting, J. F. (1981-10-20). “A negative feedback mechanism for the long-term stabilization of the earth's surface temperature” (PDF). Journal of Geophysical Research 86 (C10): 9776–9782. Bibcode: 1981JGR....86.9776W. doi:10.1029/JC086iC10p09776. オリジナルの2008-09-20時点によるアーカイブ。. https://web.archive.org/web/20080920152250/http://geosci.uchicago.edu/~archer/JournalClub/walker.1981.WHAK.pdf 2010年1月30日閲覧。. ^ Hoffman, Paul F.; Kaufman, Alan J.; Halverson, Galen P.; Schrag, Daniel P. (1998-08-28). “A Neoproterozoic Snowball Earth”. Science 281 (5381): 1342–1346. Bibcode: 1998Sci...281.1342H. doi:10.1126/science.281.5381.1342. PMID 9721097. ^ Arevalo, Ricardo; McDonough, William F.; Luong, Mario (2009). “The K/U ratio of the silicate Earth: Insights into mantle composition, structure and thermal evolution”. Earth and Planetary Science Letters 278 (3-4): 361–369. doi:10.1016/j.epsl.2008.12.023. ISSN 0012821X. ^ Gaidos, Eric J.; Güdel, Manuel; Blake, Geoffrey A. (2000). “The faint young Sun paradox: An observational test of an alternative solar model”. 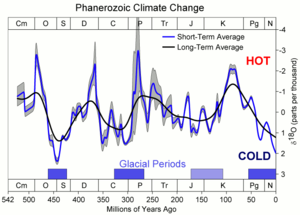 Geophysical Research Letters 27 (4): 501–504. Bibcode: 2000GeoRL..27..501G. doi:10.1029/1999GL010740. ^ Shaviv, N. J. (2003). “Toward a solution to the early faint Sun paradox: A lower cosmic ray flux from a stronger solar wind”. Journal of Geophysical Research 108 (A12): 1437. arXiv:astro-ph/0306477. Bibcode: 2003JGRA..108.1437S. doi:10.1029/2003JA009997. ^ Caffe, M. W.; Hohenberg, C. M.; Swindle, T. D.; Goswami, J. N. (1987-02-01). “Evidence in meteorites for an active early sun”. Astrophysical Journal Letters 313: L31–L35. Bibcode: 1987ApJ...313L..31C. doi:10.1086/184826. ^ Erlykin, A. D.; Wolfendale, A. W. (2011). “Cosmic ray effects on cloud cover and their relevance to climate change”. Journal of Atmospheric and Solar-Terrestrial Physics 73 (13): 1681-1686. doi:10.1016/j.jastp.2011.03.001. ^ Sloan, T.; Wolfendale, A. W. (2011). “The contribution of cosmic rays to global warming”. Journal of Atmospheric and Solar-Terrestrial Physics 73 (16): 2352–2355. doi:10.1016/j.jastp.2011.07.013. ^ Peale, S. J. (2003). “Tidally induced volcanism”. Celestial Mechanics and Dynamical Astronomy 87 (1/2): 129–155. doi:10.1023/A:1026187917994. ISSN 09232958. ^ Rosing, Minik T.; Bird, Dennis K.; Sleep, Norman H.; Bjerrum, Christian J. (2010-04-01). “No climate paradox under the faint early Sun”. Nature 464 (7289): 744–747. Bibcode: 2010Natur.464..744R. doi:10.1038/nature08955. PMID 20360739. ^ a b c Sahni, Varun; Shtanov, Yuri (2014). “Can a variable gravitational constant resolve the faint young Sun paradox?”. International Journal of Modern Physics D 23 (12): 1442018. doi:10.1142/S0218271814420188. ISSN 0218-2718. ^ Teller, Edward (1948). “On the Change of Physical Constants”. Physical Review 73 (7): 801–802. doi:10.1103/PhysRev.73.801. ISSN 0031-899X. ^ Gamow, G. (1967). “Electricity, Gravity, and Cosmology”. Physical Review Letters 19 (13): 759–761. doi:10.1103/PhysRevLett.19.759. ISSN 0031-9007. ^ Kaspi, V. M.; Taylor, J. H.; Ryba, M. F. (1994). “High-precision timing of millisecond pulsars. 3: Long-term monitoring of PSRs B1855+09 and B1937+21”. The Astrophysical Journal 428: 713. doi:10.1086/174280. ISSN 0004-637X. ^ Verbiest, J. P. W.; Bailes, M.; van Straten, W.; Hobbs, G. B.; Edwards, R. T.; Manchester, R. N.; Bhat, N. D. R.; Sarkissian, J. M. et al. (2008). “Precision Timing of PSR J0437−4715: An Accurate Pulsar Distance, a High Pulsar Mass, and a Limit on the Variation of Newton’s Gravitational Constant”. The Astrophysical Journal 679 (1): 675–680. doi:10.1086/529576. ISSN 0004-637X. ^ Williams, J. G.; Newhall, X. X.; Dickey, J. O. (1996). “Relativity parameters determined from lunar laser ranging”. Physical Review D 53 (12): 6730–6739. doi:10.1103/PhysRevD.53.6730. ISSN 0556-2821. ^ Wu, Feng-Quan; Chen, Xuelei (2010). “Cosmic microwave background with Brans-Dicke gravity. II. Constraints with the WMAP and SDSS data”. Physical Review D 82 (8). doi:10.1103/PhysRevD.82.083003. ISSN 1550-7998. ^ Accetta, Frank S.; Krauss, Lawrence M.; Romanelli, Paul (1990). “New limits on the variability of G from big bang nucleosynthesis”. Physics Letters B 248 (1-2): 146–150. doi:10.1016/0370-2693(90)90029-6. ISSN 03702693. ^ Dirac, P. A. M. (1937). “The Cosmological Constants”. Nature 139 (3512): 323–323. doi:10.1038/139323a0. ISSN 0028-0836. ^ Wordsworth, R.; Kalugina, Y.; Lokshtanov, S.; Vigasin, A.; Ehlmann, B.; Head, J.; Sanders, C.; Wang, H. (2017). “Transient reducing greenhouse warming on early Mars”. Geophysical Research Letters 44 (2): 665–671. doi:10.1002/2016GL071766. ISSN 00948276.